The trainers actually told people it would bring them "luck." 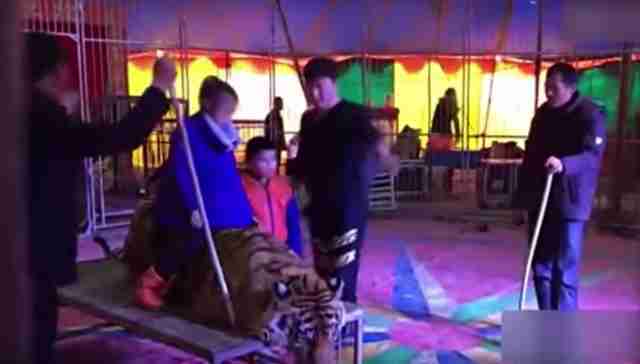 In a recent video, a tiger is pushed flat against a table and tied down with ropes inside a circus tent. A man pushes his full weight onto the tiger's head as other men pull the ropes taut. The tiger gasps for breath. When the tiger probably thinks it can't get any worse, a woman mounts him like she's riding a motorcycle. Kids bounce on his back. Everyone snaps photos. 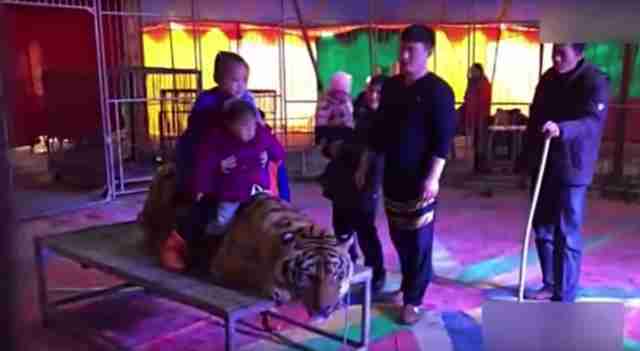 The incident occurred last week at a traveling circus in Yiyang, Hu Nan Province, although the name of the circus remains unknown, according to Ashley Fruno, a senior campaigner for PETA Asia. "The guy speaking in the video said, 'It's so elegant to ride on such a fierce tiger - riding the tiger will make you have luck and fortune,'" Fruno told The Dodo. At the end of the video, when the visitors have gotten their share of photos, the men pull the ropes off the tiger. The terrified animal leaps off the table, and dashes into his pen before they do anything else to him. 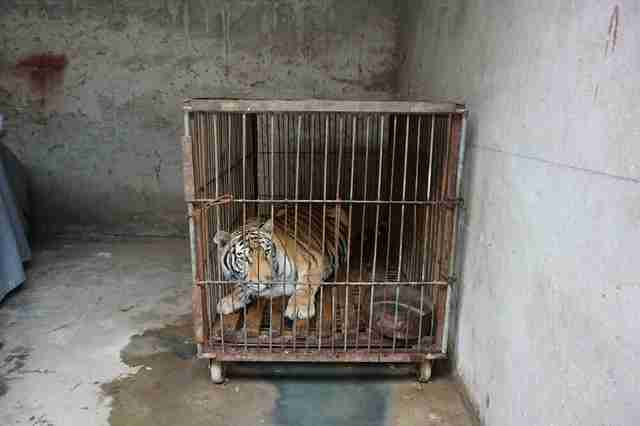 The act of tying a tiger down might seem unthinkably cruel, but this kind of thing can happen regularly, Fruno said, noting that there are more than 300 circuses in the city of Suzhou, China, alone. "[We] toured 10 different circuses and training facilities, documenting appalling physical and psychological abuse, decrepit living conditions and animal suffering on a massive scale," Fruno said. 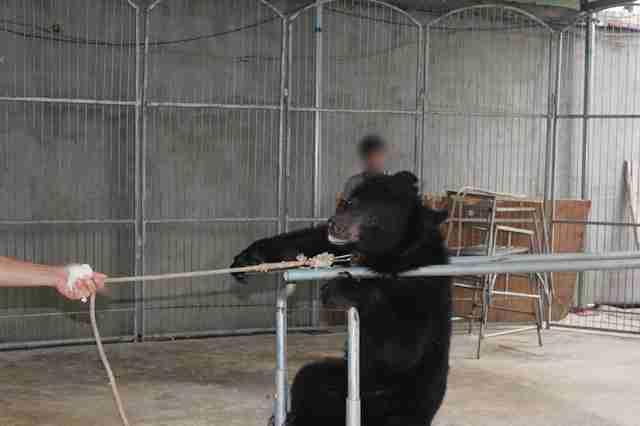 People have also documented circus performers dragging a bear across a stage when he refused to perform a show at the Qingdao Safari Park. 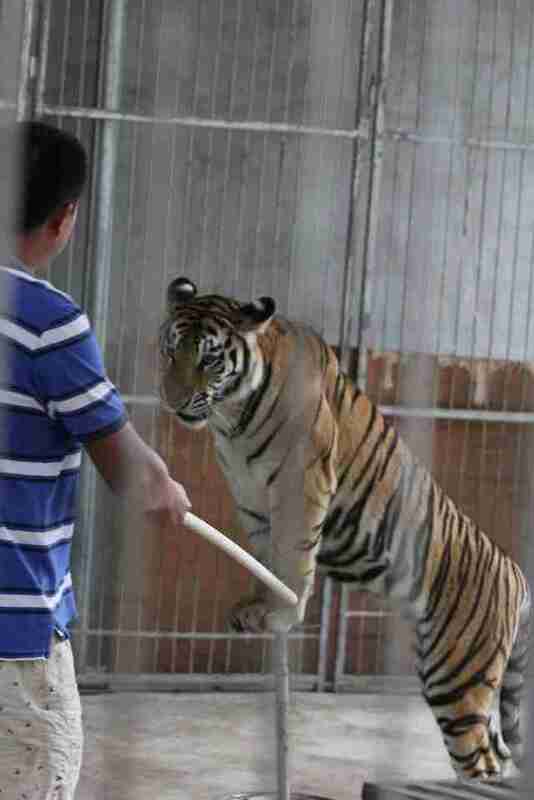 At a different circus performance, at Wenling Zoo, a man bounced up and down on a tiger while beating his head. "Fear drives most animals to perform," Fruno said. "They balance on objects, jump through hoops and walk in unnatural positions to avoid the pain that they know trainers will mete out if they fail or refuse." "Many of the animals [during the investigation] exhibited signs of severe distress, including repetitive pacing, rocking and head-bobbing, which are all consistent with stress caused by constant confinement, deprivation, neglect, fear and pain," Fruno added. "In addition, every circus inspected was seriously deficient in the areas of food, drinking water, housing, veterinary care and environmental enrichment." What's more, the tiger in the video was probably drugged. "The only way to make these highly intelligent and powerful hunters pose for the camera is to drug them, keep them under constant threat of punishment, intimidate them and restrain them," Jason Baker, vice president of PETA Asia, told The Dodo. "This tiger was also bound and strapped so tightly that he couldn't even lift his head." And many of these circuses may be operating illegally, according to Chunmei Hu, project manager for Freedom For Animal Actors. "If they are legal, the circus must have the relevant licenses - feeding permits, business licenses, performance licenses, transport licenses, site safety permits," Hu told The Dodo. "Yet most of the circuses do not have these permits." Not only that, but the State Forestry Administration in China prohibits physical contact between animals and visitors, according to Hu. The reason they get away with it is because the circus industry is poorly regulated, and law-breakers are rarely punished, Hu explained. "The law says we can't abuse the animals," he said. "I feel the animal shows must be stopped." Of course, it's important to remember that China isn't the only country that exploits and abuses animals in the circus. Elephants - as well as other animals - are routinely abused and forced to perform in circuses and zoos in the United States. "No tiger would trade freedom for captivity - to be caged, dominated, tied down, whipped and used as a prop for a tacky photo," Baker said. "We urge everyone who cares about animals to avoid animal attractions, both at home and abroad." 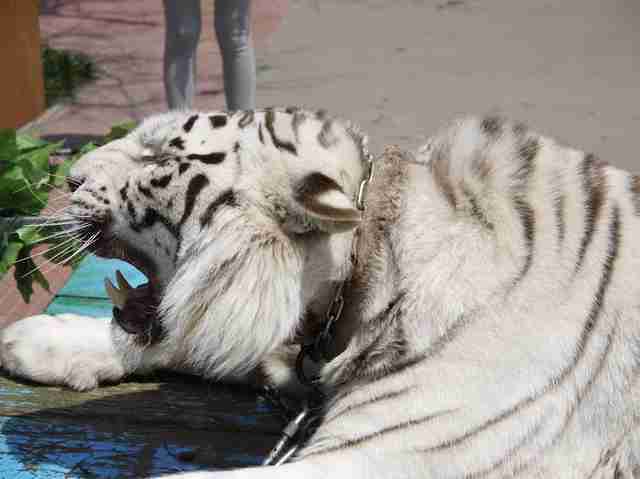 To help tigers - as well as bears, lions, monkeys, elephants and other circuses animals - you can sign this petition. You can also support investigations of circuses and similar facilities by making a donation here.